Do your doctors share what they have learned from you? Likely not! 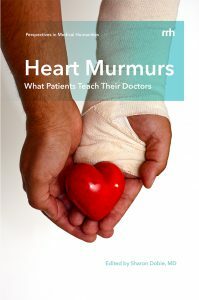 With little precedent for physicians to open up about the impact their patients have on their personal development, Heart Murmurs: What Patients Teach Their Doctors breaks tradition with a collection of stories by author and editor Sharon Dobie M.D. and 35 other physicians. Aware for years that her patients taught her at least as much as she gave them, Dr. Dobie’s acknowledgement of this reciprocity led to this project. Grouped thematically, the stories encourage health care providers to think about their relationships with patients and through that reflection, to know themselves more deeply. They also take all readers from the specific to universal messages, asking all of us to see how we are changed within all relationships, doctor-patient or otherwise. These humanizing tales draw us back to basics: relationships matter for us all.